Tarragon is native to southern Russia and western Asia. Tarragon isn’t as common in the United States as black pepper, basil or oregano, but perhaps it should be. Tarragon is slightly peppery and has a taste that’s somewhat similar to fennel, anise and licorice. Tarragon is an aromatic herb used to add flavor to many dishes and sauces and can be steeped in water to make a tea, as infused oil, as an essential oil or chewed fresh. 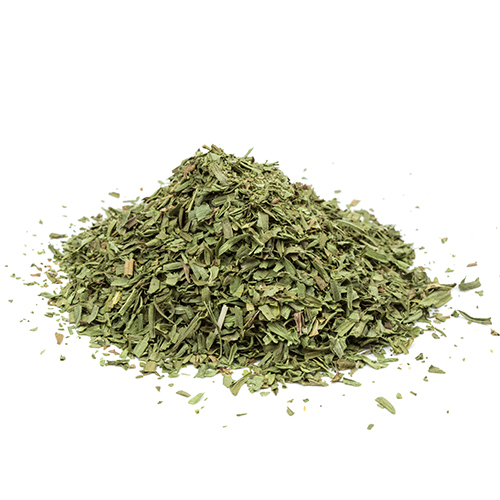 Tarragon is known as “the King of Herbs” in France, and in this case it’s a well-earned title. Tarragon is a mainstay in French cooking and an essential ingredient in both BÃ©arnaise sauce and the combination of herbs known as fines herbes. Its royal status hasn’t carried over stateside, not yet anyway. When we add fresh herbs to a dish, we’re far more likely to reach for basil, chives, or even cilantro, only procuring tarragon when a recipe calls for it, it’s time for that to change. Tarragon leaves are so tender; they can be mixed in with other greens for salads or sprinkled over a finished dish much like parsley. The anise flavor goes well in tomato-based soups, or in tomato sauces for pasta. Add fresh tarragon to all sorts of egg dishes, from scrambled to deviled. Tarragon can also be infused into simple syrup to use in cocktails and summer coolers. Tarragon loses its flavor when cooked so you will need to add it fresh to get the full impact of flavor. When it is necessary to cook it, such as in a soup or stew, add it at the end of the cooking process. Tarragon pairs well with poultry, eggs, and hearty soups that are especially comforting when the weather is cold. Also, mixing fresh tarragon into a salad dressing can make a boring bowl of greens come to life. Sow tarragon seeds in April or before the last frost indoors in a small pot. Water the plant regularly, allow the soil to go almost dry before watering again, or else the seedlings will suffer. After 10 to 14 days of regular watering, the seeds will start to grow, then transfer the pot outdoors where it can receive full sunlight. There’s no specific time to harvest tarragon, though, a good indicator for harvesting is when the plant reaches a height between 12 and 36 inches. Use shears when picking off the leaves because they are very delicate.